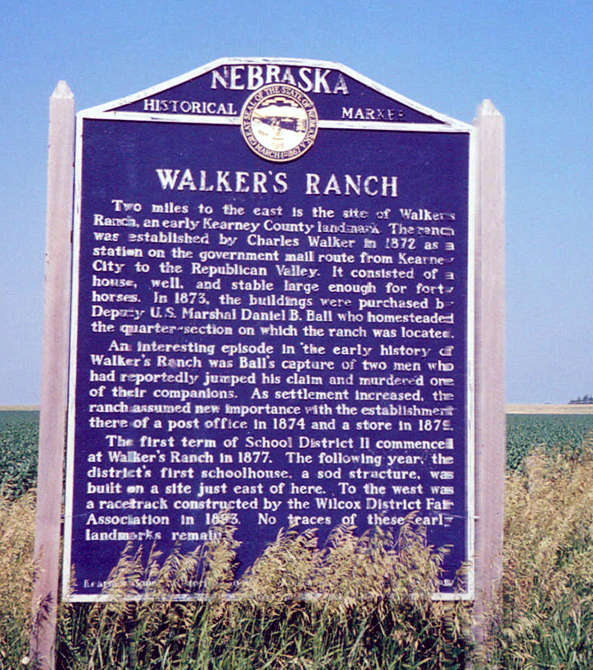 Two miles to the east is the site of Walker's Ranch, an early Kearney County landmark. The ranch was established by Charles Walker in 1872 as a station on the government mail route from Kearney City to the Republican Valley. It consisted of a house, well, and stable large enough for forty horses. In 1873, the buildings were purchased by Deputy U.S. Marshal Daniel B. Ball who homesteaded the quarter-section on which the ranch was located. An interesting episode in the early history of Walker's Ranch was Ball's capture of two men who had reportedly jumped his claim and murdered one of their companions. As settlement increased, the ranch assumed new importance with the establishment there of a postoffice in 1874 and a store in 1879. The first term of School District 11 commenced at Walker's Ranch in 1877. The following year, the district's first schoolhouse, a sod structure, was built on a site just east of here. to the west was a racetrack constructed by the Wilcox District Fair Association in 1893. No traces of these early landmarks remain. “Walker's Ranch,” Explore Nebraska History, accessed April 18, 2019, https://mynehistory.com/items/show/296.